My first secretary later worked for Rinehart, and never had a harsher word to say other than she was 'an unusual lady'. She must have been raised by a mum, like mine, who said if you can't find something nice to say, don't say anything. Good advice for anyone deriding Rinehart for her 'unattractiveness'. The Victorian Government plans to introduce performance pay for teachers. The teachers' union has objected on the grounds that teachers are special. Its argument is faulty. Performance pay is not wrong for teachers because they are special, but because it is wrong for everybody. 'Monday is Day Oncology, where the dark burses arrive by courier, and we're glad to see them stripped for action, hooked in the air, lucent against fear.' Maybe only Steele could see these bags of chemo as Christological signs. As with the zoo once, so now the oncology ward offers hints of that other eden. I once received a postcard from White and his partner Manoly Lascaris. It responded to a note I had sent to White telling him we had named our new baby son Patrick Manoly. Our son is now a young man who occasionally wonders if he is the only bloke in Australia to be named after a gay couple. Duplicity in politics is not new. Every utterance is tainted by the subtext of scoring points. If it is painful for us to listen, how much worse must it be for the politicians? It is dispiriting to constantly undermine one's own integrity, and the 'dodgy salesman' is no one's ideal of human flourishing. The largely positive response in Australia to the American Lingerie Football League reveals we are not the progressively egalitarian people we imagine ourselves to be. We give lip service to female equality, but women will still be exploited whenever the opportunity arises, and feminists vilified like it's 1972. Recently Catherine Deveny tweeted that my claim to be a Catholic and a feminist showed I was 'suffering serious cognitive dissonance'. Many gay Christians are confronted by a similar lack of understanding from non-believers who can't understand why they would embrace a Church that rejects them. A group of women debate whether familiarity with a long-term spouse is not better than the passion of a new relationship. Everything new gets old, argues one woman. Take This Waltz is a kind of morality play about a woman torn between the familiarity of the old and the excitement of the new. 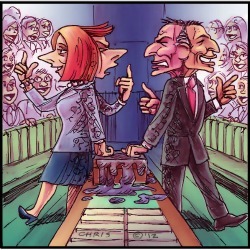 A Herald/Neilsen poll this week showed that Rudd leads Gillard by 62 per cent to 32 per cent. But that figure is distorted by the overwhelming pro-Rudd preference of Coalition voters, who prefer Rudd to Gillard by 71 per cent to 19 per cent. The motivation behind this preference is not immediately clear. Poverty is the unpaid rent of 200 years of colonisation. Poverty leaves a kid to her own solitary devices in the corner of a one-bedroom unit. It is pensioners eating canned excuses for a decent meal. Poverty is what happens when I don't care about you and you don't give a toss about me. It is foolish to focus on the detail of one scandalous union funds abuse, the misbehaviour of another high profile government official and the impact of some new progressive taxes on our personal lives, while ignoring the government's significant achievements under the most trying political circumstances.